MOHAN USA’s Annual Fundraiser was held on September 10th, 2016 at The Mirage in Edison, New Jersey. 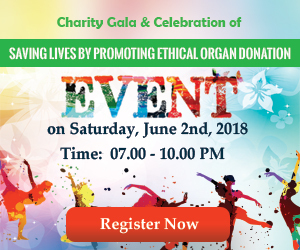 The event was organized to raise awareness about ethical organ donation programs in India, spread the word about the tremendous achievements of MOHAN foundation, and to build relations with the community half a world away that is sympathetic to the problems patients in India face while suffering from terminal organ failure. The keynote speakers for the evening were Dr. Anil Chandraker, President of the American Society of Transplantation and Dr. Sunil Shroff, founding trustee of MOHAN foundation. After being introduced by the president of MOHAN USA, Dr. Anirban Bose, Dr. Anil Chandraker spoke of his own experience at the MOHAN foundation program in Chennai, India. The enthusiasm and dedication he had witnessed amongst the coordinators and grief counsellors of MOHAN foundation had left him with a lasting impression of their commitment to the cause. He congratulated MOHAN foundation on its work of facilitating deceased donor organ transplants in India, acknowledging the success of the program despite the many challenges faced both in terms of resources and logistics. This was followed by Dr. Sunil Shroff’s speech where he highlighted the many achievements of MOHAN foundation over the years, including public awareness campaigns, training of grief counsellors, legislative efforts, opening of new branches and offices both India and abroad. Then, he invited Dr. Chandraker to inaugurate the “be the change” initiative – an online forum where those who wish to volunteer their time and expertise to altruistic efforts in India can interact with organizations and initiatives with mutually common goals. Dr. Shroff also introduced to the crowd Mr. Luv Dhony, a young engineer who had received a life-saving liver transplant, the donor being none other than the son of Lalitha Raghuram, the country director of MOHAN foundation. His story was followed by other patient stories recounted by Mr. Mohan Mahal, one of the longest surviving heart transplant recipients, and Mr. Srini Garla the recipient of three kidney transplants. Their stories were a powerful reminder of both the tremendous work of MOHAN foundation and the nobility of this cause. A lavish buffet was laid out for the hundred plus guests that evening. Music followed with performances by Dr. Suresh and Mrs. Banerjee, who entertained the audience with lively Bollywood numbers from the yesteryears. The floor was opened to the audience who joined with enthusiastic dancing to DJ Aatish’s music. Guests opened their hearts to the moving message of MOHAN USA and donated generously, resulting in over $ 35,000 being raised that evening. However, more importantly, the message of MOHAN USA rang out loud and clear amongst many more, with instructions to play it forward and spread the word. The first Annual MOHAN USA launch was a grand success. It will serve as a stepping stone to many more events in the future. We hope to raise awareness, raise funds as well as put to use all our resources to benefit the patients who need an organ transplant to survive the curse of terminal organ failure.